Southern Metal Roofing understands that your home is your most valued asset, and maintaining that investment is your number one priority. That’s why discriminating Atlanta area homeowners in Dunwoody, Sandy Springs, Alpharetta and Johns Creek select our metal roofing for its distinctive beauty and durability. With a lifetime warranty, our Kassel & Irons products ensure long-term protection and security that significantly increases the value of your home. With a wide variety of advanced finish colors, KasselWood Steel Roofing will maintain its quality appearance and performance for years to come on your Atlanta area home. The beauty of wood shingles in a wide variety of advanced finish colors, KasselShake Metal Shingle is a visually appealing roof that will accentuate and add value to any home. Know the signs. 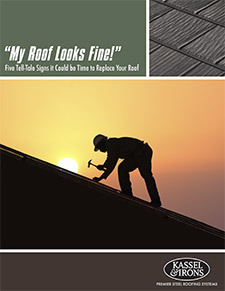 Download our FREE Roofing Guide. All images and content ©2019 Isaiah Industries, Inc. & Kassel & Irons. Southern Metal Roofing is a division of U.S. GreenSource Corp.